I made Simplicity #2182 View C a while ago and forgot to post it online. I used a teal knit interlock fabric from Jo-Ann Fabrics. I am not happy with how this came out. 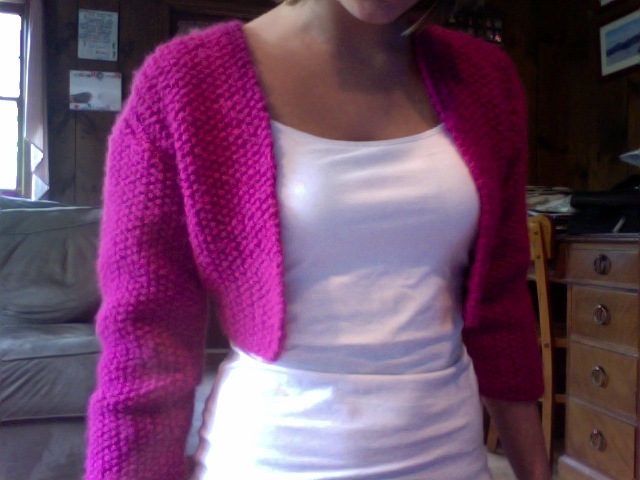 I made it too big so it isn't flattering and I think it's too short. I didn't like how the ruffle edges were supposed to be unfinished so I lined them with left over black lace from previous projects. I only did one ruffle on the top and one on the side instead of two like the pattern called for. 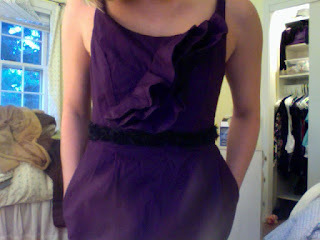 As you can see, I had a hard time sewing the ruffle onto the top. What I did like about this project is the braided strap and how the back looks. 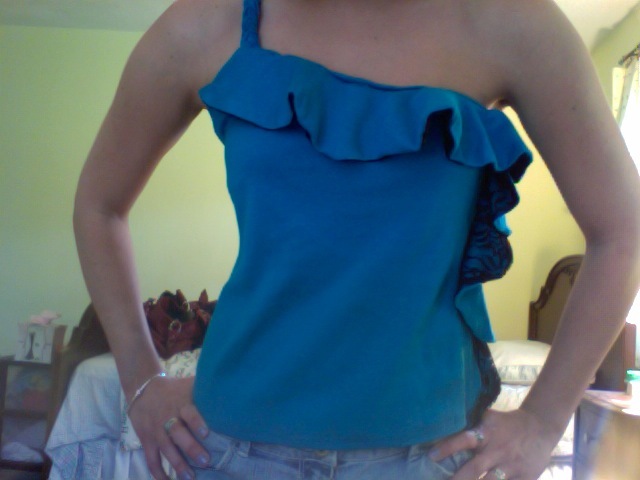 I'm thinking about making this top again in white but smaller, longer, and with the ruffles done the way the pattern calls for. 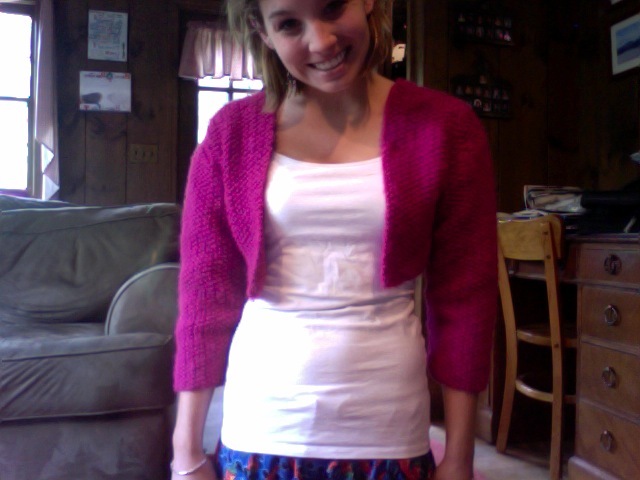 I started McCall's #6349 over a month ago and I finally finished it. It wasn't hard, but the boning would definitely be too great a challenge for a first-time sewer. I didn't do the bodice underlining because I felt the lining was sufficient. 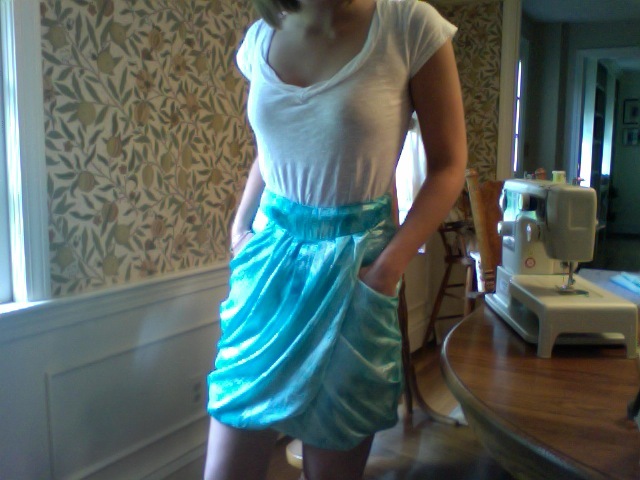 I didn't line the skirt because the fabric wasn't sheer so I didn't need to. I used this adorable fabric from the red tag section at Jo-Ann Fabrics. 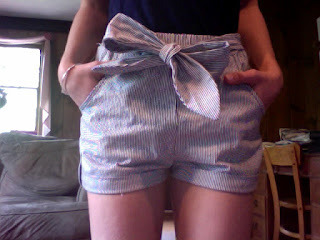 It's the same fabric I used for the striped high-waisted shorts but in this adorable Tiffany's blue color. 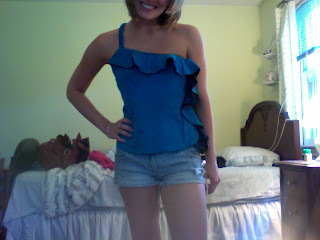 The pictures don't show how cute it really is. 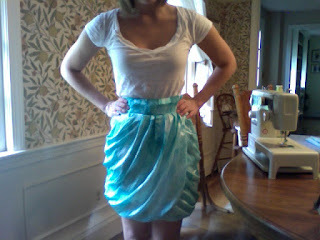 For the lining I used a stretchy teal gauze fabric also from the red tag section at Jo-Ann Fabrics. 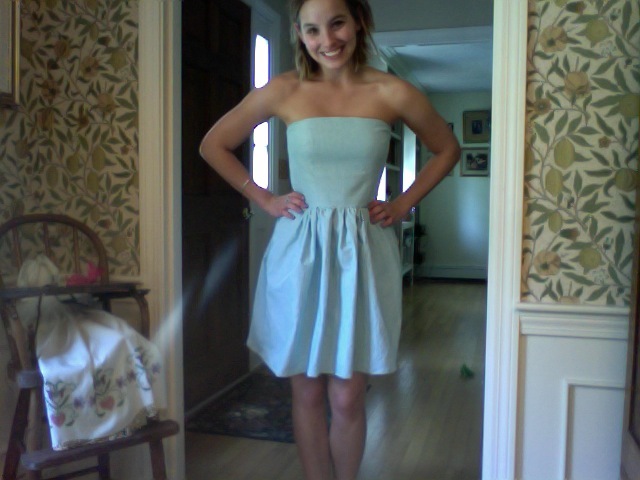 The reason it took me so long to finish this dress is because it came out huge. HUGE. 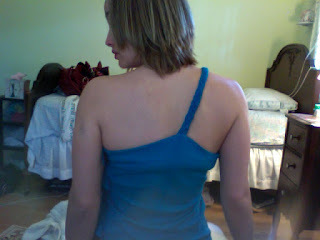 I had to cut at least an inch off the back seam and it was still too big. (Upon reflection, maybe I should have made the A-cup bodice instead of the B-cup.) I didn't want to take any more fabric out of the back seam because I didn't want to screw up the boning so I made a dart in both sides of the bodice using my new dressform (which worked perfectly, by the way). 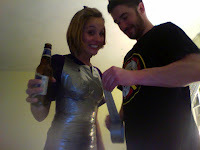 So I decided I desperately needed a dressform and after researching them on the internet I enlisted the help of my boyfriend to make one out of duct tape. I used this tutorial from the Etsy Labs Archives. 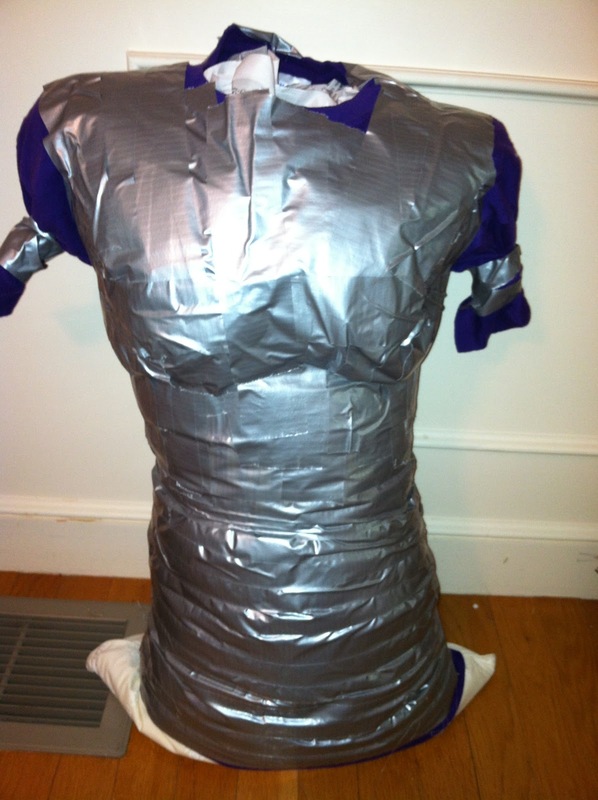 I stuffed my dressform with newspaper and one of my mom's pillows. It worked pretty well; I successfully used it to fit a dress I'd been having a hard time with. This is McCall's #6439. It was pretty easy. I got nervous while I was cutting out the pattern because it was so intense and weird, but I had no problem putting it all together. 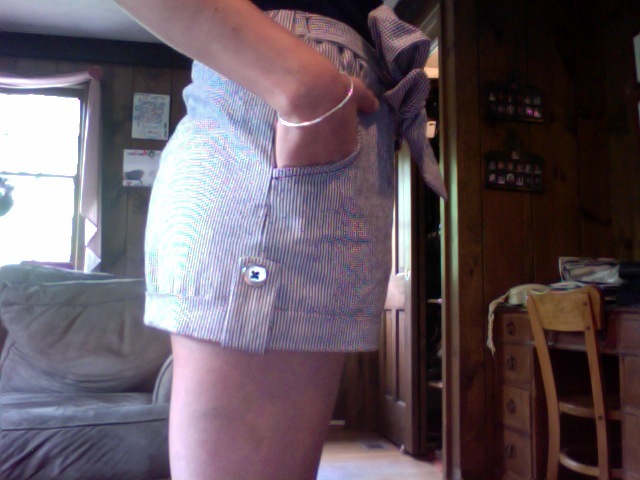 One thing that I don't love about this pattern is that you can't change the skirt length. The lining and the shell are sewed together at the bottom so in order to alter the hem you'd need to undo a lot of sewing. 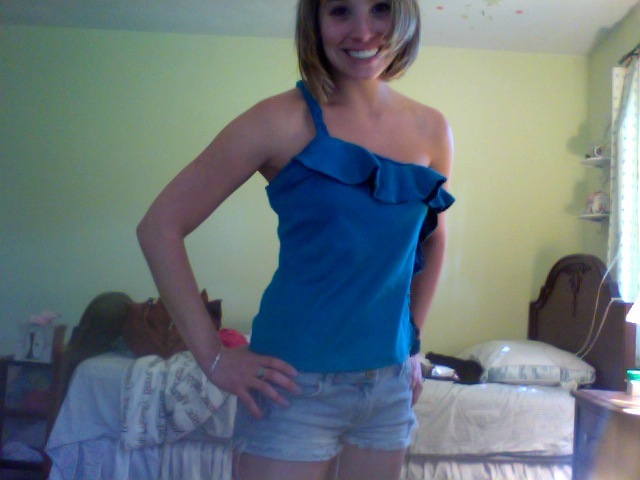 I got lucky that the length was all right for me, but I wouldn't mind if it were a bit shorter. 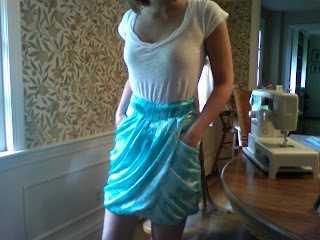 I used a Simply Silky print from Jo-Ann Fabrics. It was not super easy to work with; it was very slippery. 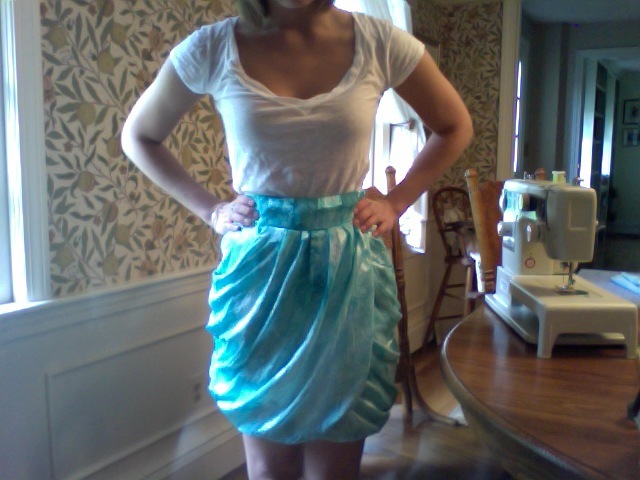 For the lining I used a teal Tropical Punch fabric from Jo-Ann Fabrics. I decided to start an afghan at the end of March. I got distracted by my pink shrug, so it's not moving along very quickly. I was originally inspired by the free Crochet Sampler Throw on the Lion Brand website, but it is turning out to be a combination of different patterns. 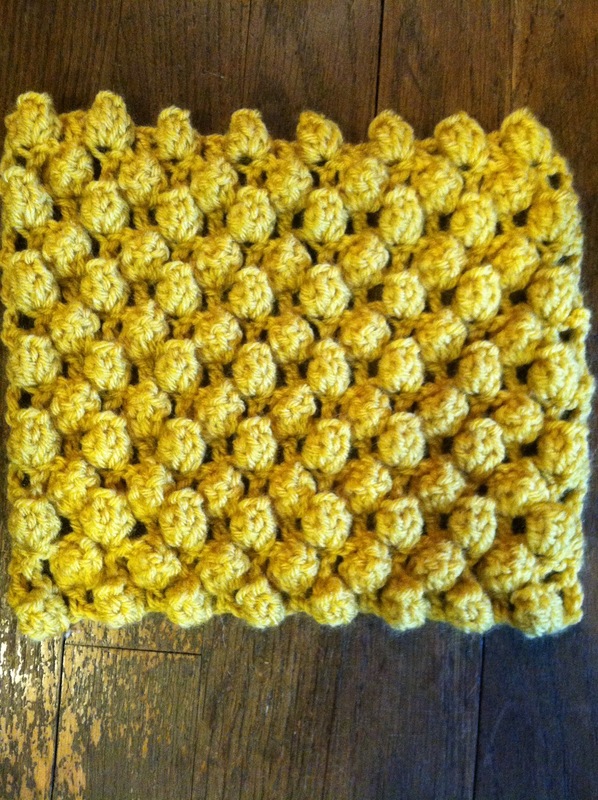 The yellow popcorn square is from the original sampler throw pattern. The yarn is Lion Brand Vanna's Choice worsted weight yarn in mustard. 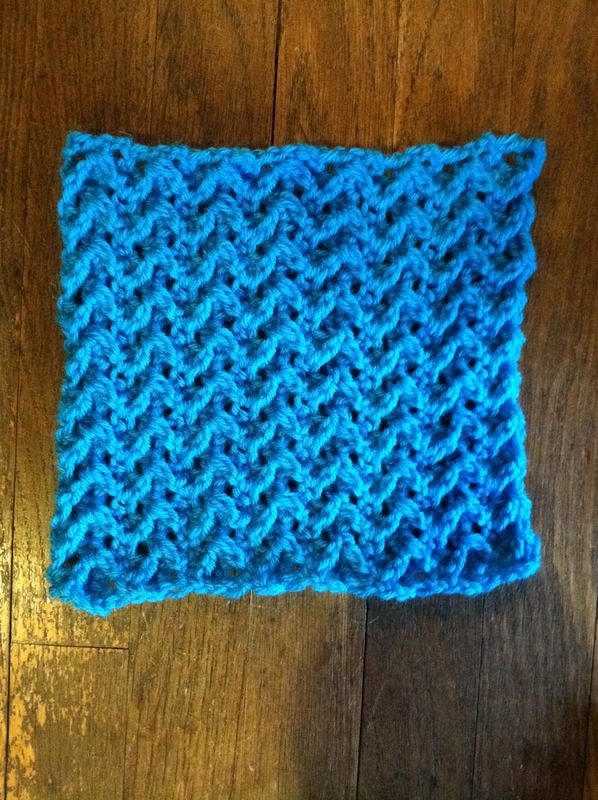 The blue square is also from the original sampler throw pattern. 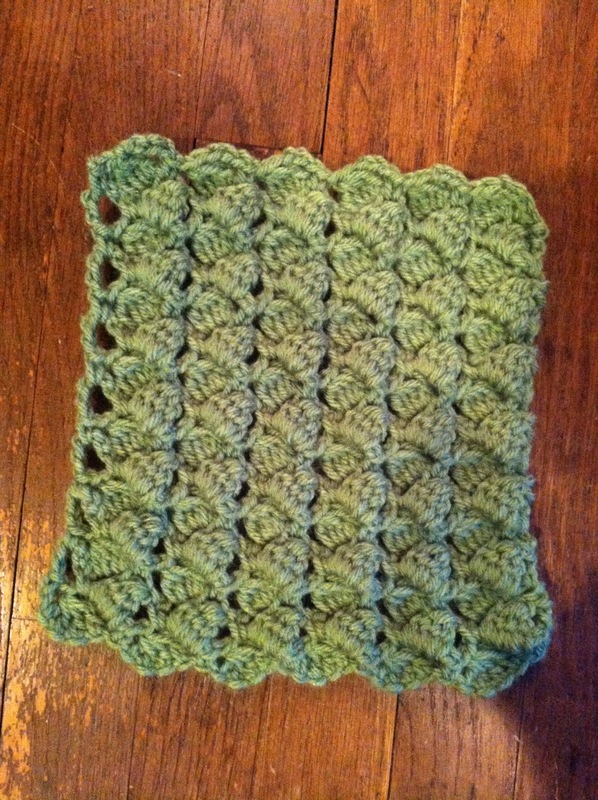 The yarn is Lion Brand Vanna's Choice worsted weight yarn in Aqua. 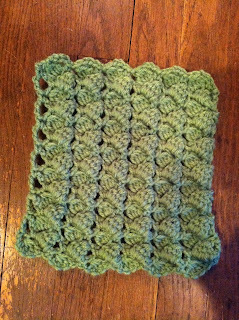 The green square is also from the original crochet sampler throw pattern. 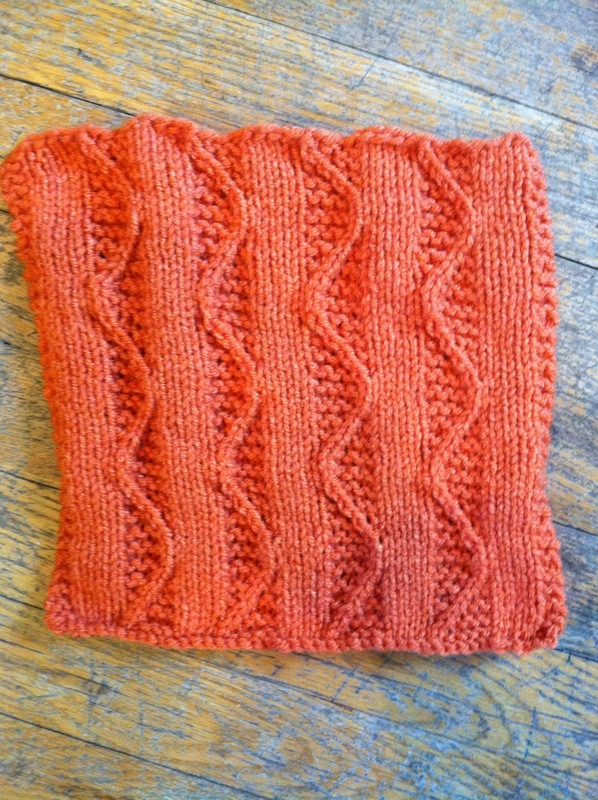 The yarn is Lion Brand Vanna's Choice worsted weight yarn in Fern. 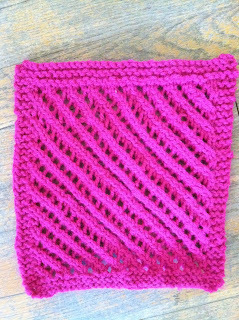 The yarn is Lion Brand Vanna's Choice Baby worsted weight yarn in Berrylicious. It's less fuschia and more of a red pink in real life. The square on the left is from the original crochet sampler afghan pattern. I think it's a bit boring, so I knitted the square on the right, which is from the free Patch Sampler Throw pattern on the Lion Brand website. I'm not sure which one I will use in the afghan. 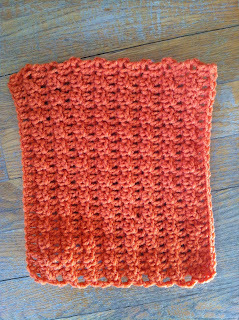 The orange yarn is Red Heart worsted weight yarn in Carrot. 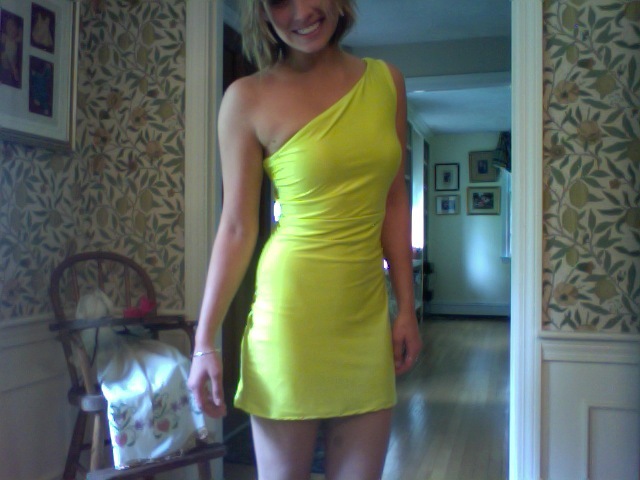 I found this wicked stretchy neon yellow/green knit fabric at Fabric Place Basement in Natick, MA and I just had to have it. I used McCall's #6281. I started making View A but I ended up changing the top to make it one-shouldered. 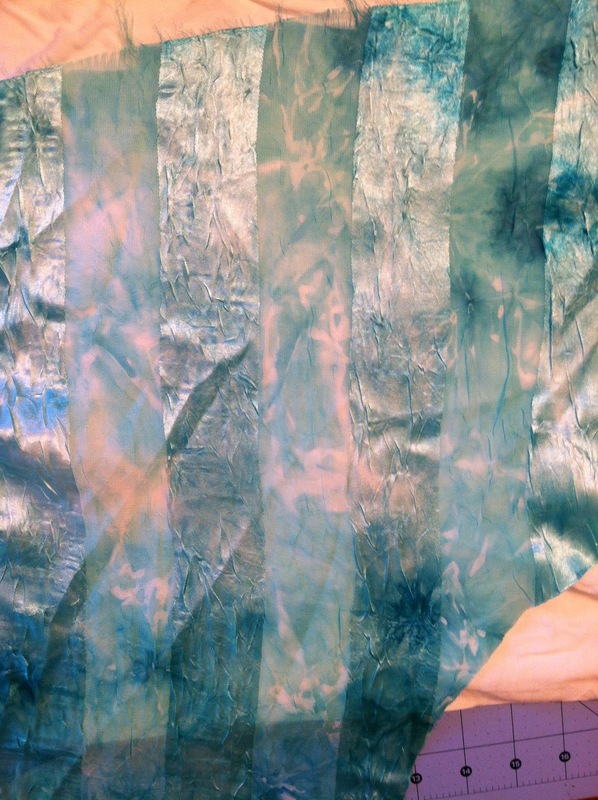 I had to double-layer the fabric because it was so sheer, which was nice because then I had a facing for the top and didn't have to top stitch around the neck. I used bias tape for the arm hole and I wasn't sure how bias tape would work on a stretchy fabric, but it worked out well. This pattern was wicked easy - almost as easy as the high-waisted shorts/skirt pattern I keep using. There were very few pattern pieces and nothing too crazy, but could be because I didn't do the neckline or the back like I was supposed to. 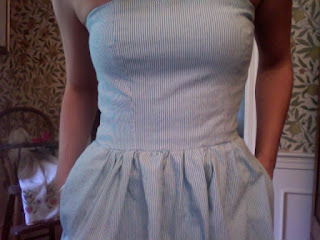 I will say that topstitching the neckline could probably get a bit dicey. 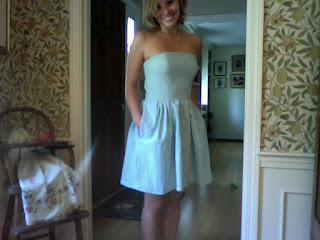 I used a very slippery fabric and it was impossible to do a turn-and-stitch hem or neckline. I made these shorts using some clearance fabric I got at Jo-Ann Fabrics. 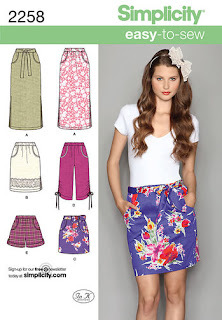 The pattern is Simplicity #2258, which is the same one I used for the floral high-waisted shorts and the floral high-waisted skirt. 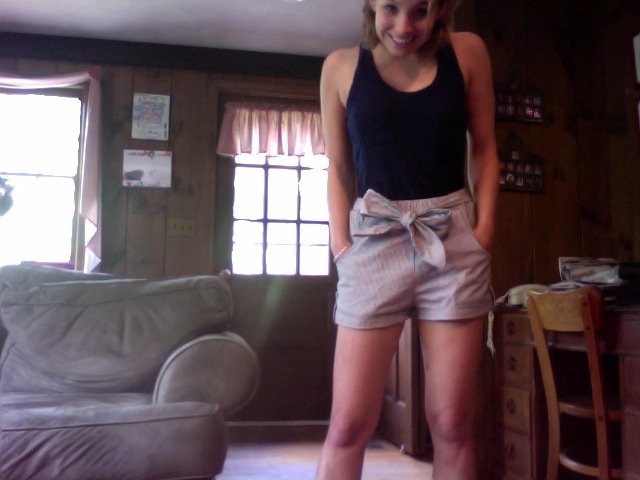 They are wicked cute and I have gotten a ton of compliments on them. This was my first sweater project. I used Lion Brand Jiffy bulky yarn in Shocking Pink. 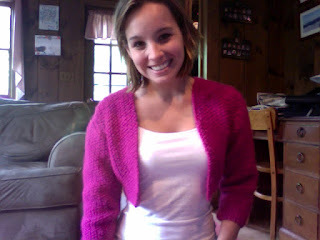 I got the DROPS Simply Red Shrug pattern for free off the DROPS/Garn Studio website. I think the pattern was wicked easy and definitely a good first-sweater pattern. The sleeves came out a little baggier than I anticipated, but I think it's still cute. 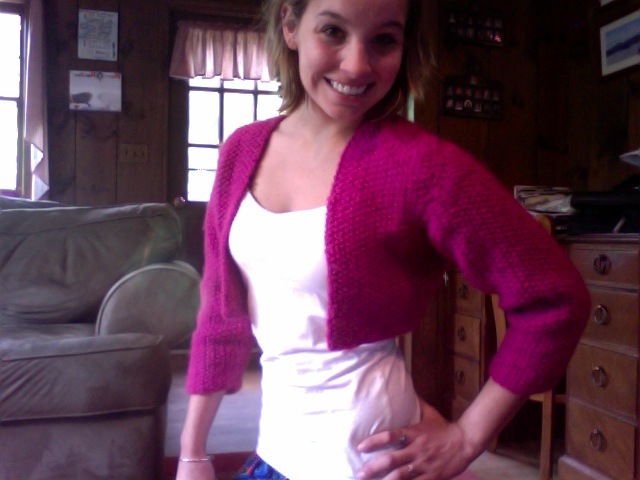 I used McCall's Pattern #6518. The fabric is a purple bottomweight from Jo-Ann Fabrics. 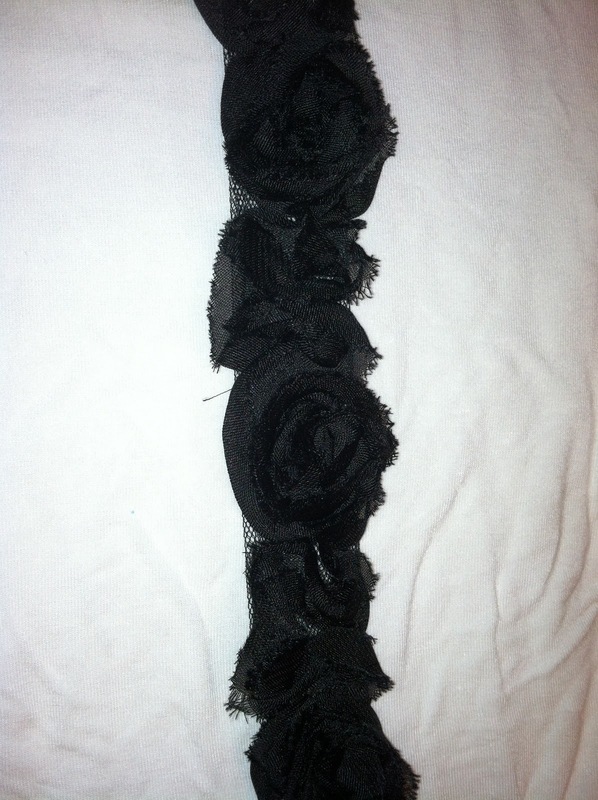 I had black lace left over from the lace top I made, and I used it underneath the ruffles. There were a few things I didn't like about this pattern. First, I didn't like how the pattern wanted the ruffles to be finished - or should I say not finished. 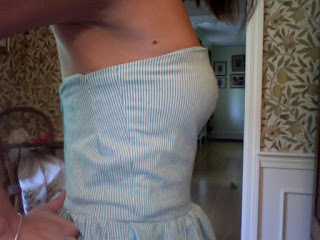 The pattern wants you to do the ruffles in such a way that their undersides are visible. That's not pretty or cute (hence the lace). 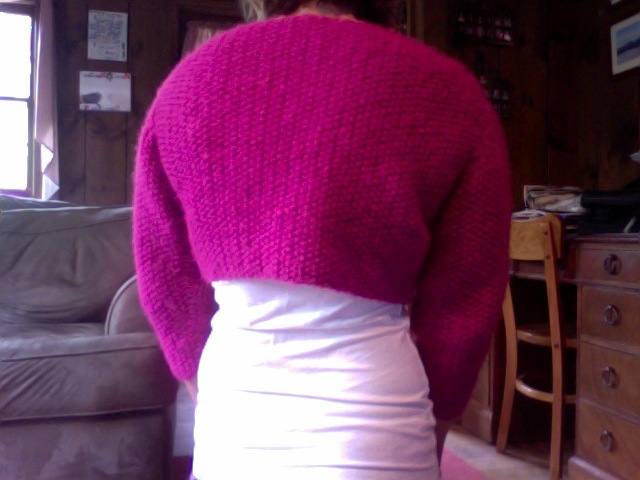 Second, I didn't like handstitching the front and back together at the shoulder seam. I made this a while ago so I can't really remember the details, but I believe I felt there was a lack of fabric to work with. This was one of the first projects I did after I picked up sewing after a 5 year hiatus, so it is possible that I am the problem, not the pattern. I wouldn't recommend this pattern for a very beginner. Not only do I disagree with the unfinished ruffles and the weird shoulder seams, but having to make the whole lining in addition to the dress is a lot of work for someone just starting out. It would probably be a pretty easy project for someone with a couple projects already under her belt. This is the black ribbon I used around the waist. I washed and ruined the first one so I had to take it off and replace it. 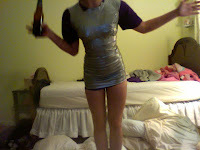 I think I would like to make this again out of a fabric with a print or design. I truly love the plaid version of this dress on Green Apples.